Six-pack abs is one of the most sought after goals in the fitness world today. There is just something about having a nice set of abs that everyone wants and desires. But why don’t we see more people achieving this goal? Why do you or someone you know continue to struggle to eliminate fat, put on lean muscle, and ultimately get six-pack abs? 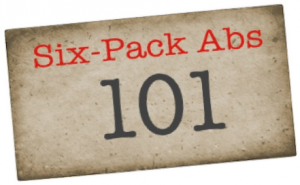 The truth is, we can all achieve six-pack abs. The problem, however, is you have not been provided with the right information on how to properly achieve a ripped set of abs and how you can achieve them fast! Not only will the tutorials below bring you six-pack abs, but they will also bring you incredible health and show you how to get in the best shape of your life. These guidelines, although focusing on bringing you six-pack abs, will bring far more than that. The exercises you will discover will benefit every area of your life, from burning tons of fat to making everyday activities easier than ever. The nutrition information will not only help you melt fat off and aid in adding lean muscle, but it will also help set you up for great long term health. Attaining six-pack abs isn’t just about getting ripped. Its about getting healthy and staying that way. What is the point of looking good if you are unhealthy? The guides below will show you how to achieve optimal health, all while showing you how to get a ripped six-pack abs once and for all!